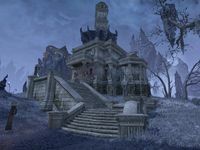 Coldharbour's Fighters Guildhall is located in the northeast corner of the Hollow City. Aleeta - Present once services open up. Candion - Present once services open up. Darien Gautier - Present from the beginning, though not after the Main Quest. Egarfin the Bold - Present once King Dynar is rescued. Ferva Hloril - Present once King Dynar is rescued. Hahnin - Present once King Dynar is rescued. Holgunn - Present once King Dynar is rescued. King Laloriaran Dynar - Present once rescued from The Lightless Oubliette. Messenger Narfild Deepcrag - Present once services open up. Sinfay - Present once rescued from the Tower of Lies. Skordo the Knife - Present once rescued from the Tower of Lies. Valorone - Present from the beginning. Vikord Skullcleaver - Present once rescued from the Tower of Lies. Vosh gra-Kreeg - Present once services open up. Turn left and follow the structures along the outside wall. You'll eventually see a Clannfear between two such structures. After dealing with the Clannfear, turn to your right and you'll see a ridged structure. You can walk up the largest ridge, away from the city. It will gradually flatten out. Just before it ends, you'll see a mound on your left you can jump to. Follow this mound up another structure. You should soon see the Guildhall in front of you. You'll need to make one more jump onto another mound to get in. Since then, a wall was taken down to access the portal to the new home, and you can now discover the hall very easily by walking near the portal. You still can't get inside without using the above directions, however. This page was last modified on 24 February 2019, at 02:22.